Who do Arlington homeowners call to get pet stains and odor out of their carpet? What a sweet gift from Santa! Don’t worry about your Arlington home. We’ll get rid of those pet stains and odor…just in time for your New Year’s Eve party! Christmas was wonderful! 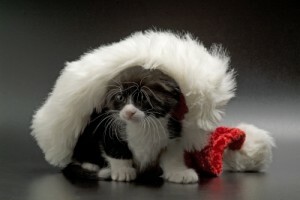 Santa visited your Arlington home and brought you and your family a precious little kitten for Christmas! You’re furry baby sure is cute, isn’t she? But the stains your sweet new little pet makes sure aren’t so pretty. And worse, is the pungent odor that comes along with those stains. It’s just hours away and you’re frantically rushing around trying to get your house in Arlington ready for the New Year’s Eve party! You know everyone will want to play with your new pet. But, you don’t want to be embarrassed by those new stains and odor. No need to fret! Arlington is one of the cities we service. In fact, we specialize in ridding your home of unsightly pet stains and odor. We’ve actually turned it into a science within itself. We utilize a three-step process. First, we use an enzymatic spray – this helps to break down the organic matter in pet urine and waste. Second, we apply a variety of antimicrobial disinfectants to actually remove the stain and clean the carpet. This helps to prevent your pet from returning to the same spot. Third, we utilize highly concentrated deodorizers to remind you of that new carpet smell. Now that you know how highly qualified we are to handle all your pet stains and odor challenges you’re faced with, why not give us a call? We can be on our way to your home in Arlington. This will free you up to finish getting ready for your party!